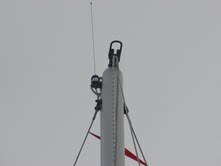 I can now get up to the top of the mast all by my lonesome with the help of the Topmaster Climber borrowed from R. It is excruciatingly slow, think inchworm. Scootching up the mast at about 3 inches gain for each knee bend and stretch. On a 32′ mast – well, you do the math. But I felt safe and did not have to worry about dropping tools on helpers below. It was also a gloriously warm still clear day and the view was outrageous. That’s my two halyards threading out over the top of the forestay, rather than smoothly running out below it as they should. When we attached the forestay in that hella hurry on December 23rd when everyone wanted to go home early, we didn’t check that all of the lines were running properly. I will climb up with the main halyard and attach a separate line to haul up the Topmaster line. Then I will go up again and re-thread the two halyards. As you may have already heard, the America Cup sailing race is coming to SF. While I’m sure there will be much jubilation for the excitement of racing boats and the crush of crowds and the extra income, all I can selfishly think about is that my playground is going to get wicked crowded and dangerous with speeding catamarans and power chase boats. More reason to be out of here before the craziness starts. Austin got to see his dog buddies last night at the park for the first time since November. He runs with great enthusiasm but little control and spends the evening after a romp licking his wounds from where he wiped out. 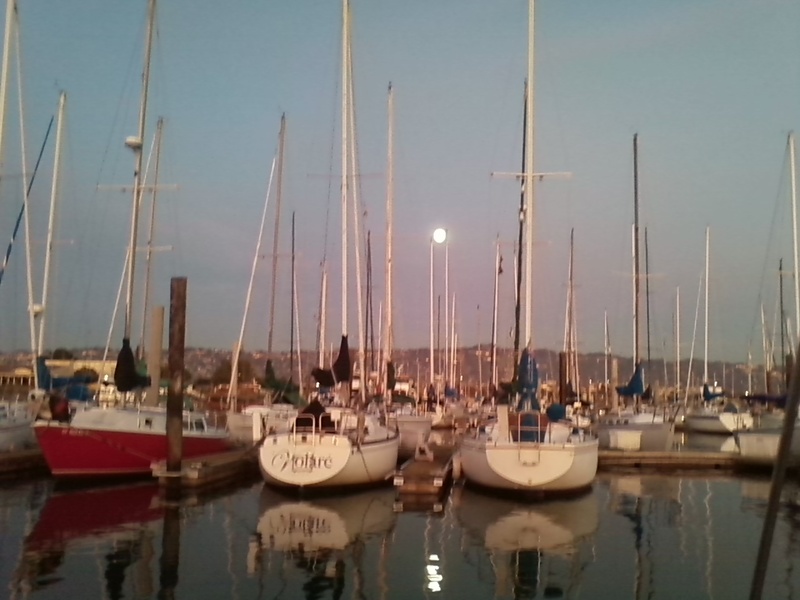 What a great sunset and moonrise. This entry was posted on Wednesday, January 19th, 2011 at 3:03 am and is filed under Boat Improvements and Firsts. You can feed this entry. You can leave a response, or trackback from your own site.